Which end do I cut off? Do I really not inhale? Which kind of cigar do I like? These are all very valid questions for the newbie cigar smoker. 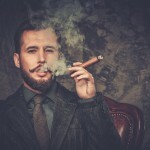 These are also questions that a newbie cigar smoker is hesitant to ask for fear of looking silly or inexperienced in front of the seasoned cigar aficionado. So we’ve put together a cheat sheet to help you get started on your new romance with cigars. How do I know what kind of cigar I’ll like? You’ve got to try it to know if you like it. And your tastes could change. Make sure to keep notes- yes, notes!- on what you’ve tried. Just like any whiskey or wine connoisseur, it will take time to truly develop your palate. Make a note of the flavors and what you liked or disliked in each cigar. You’ll notice trends develop and will be able to choose cigars to your liking more easily. 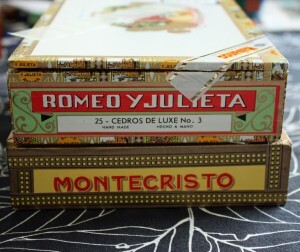 Here’s a great list of moderately priced cigars geared perfectly towards new smokers. The important thing to remember is not to go too cheap, but don’t go crazy expensive either. You won’t taste all of the nuances of an expensive cigar, so don’t waste your money early on. Which end do I cut off? Let’s talk about some cigar terminology. The end of a cigar is called the head. The point where the head straightens out into the body of the cigar is called the shoulder. The shoulder is exactly where you want to cut the cigar. It’s wide enough to draw air through the cigar and small enough so that the rest of the cigar won’t unravel. Great… now how do I light a cigar? Remember that the flavor is the thing with a cigar, so you don’t want to use a fire source that will add foreign tastes to a cigar. Matches with sulphur in the head or oil based lighters would both detract from the deliciousness of a good stogie. A butane lighter made specifically for cigars is ideal. The flame is wide enough to light the head in one try and won’t heat the cigar unevenly. Do I inhale? Do I not inhale? Do. Not. Inhale. It’s unnecessary and even the most experienced cigarette smoker will go into a coughing fit. Also, you’ll get the same effect of the nicotine without inhaling as you would inhaling cigarette smoke. Yes, cigars contain nicotine. Do I smoke a cigar all at once or can I save it? A cigar can be relit within the same sitting, but don’t try to keep a partially smoked cigar for another day. It’s been open too long for the flavors to remain pure and could ruin your experience with that particular cigar. That doesn’t mean you MUST finish the cigar. 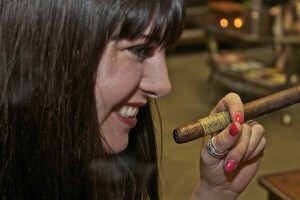 If you’ve enjoyed the cigar thoroughly, you can put out the cigar without smoking it to the nub. I think I’m ready. Now what? Visit us at our Denver, Colorado cigar shop!